The sanctuary of the United Methodist Church in Easton, Ohio has been prepared for Worship Service tomorrow morning, just as it has been since 1878. Tonight, however, it is another traditional service, dating back to the Great Depression of the 30's, a Community Bean Supper. Although the depression is now only a bad memory, the Bean Supper is still a part of the community in the spring and in the fall. Norma and Eilene stood ready to dish up the beans when the diners started early, around 4:30. The bean supper is from 5:00 to 7:00 PM but folks always come early. All the food is donated and prepared by the members. I saved a large ham bone from the Easter ham for my 8 pounds of beans. A lot of people, including Julie, baked cornbread. There were cut up sweet onions and assorted relishes. simmering in the pan, and piping hot coffee, beat it if you can. The oldest couple present were Delbert and Connie Rausechenberg. Delbert, born into the church some 91 years ago, was present at the very first bean supper. His grandmother, a German immigrant, was a member of the church. Delbert was a true hero serving in the U.S. Navy in World War II. Few men have been involved in a beach invasion. Delbert, a cox'n on a landing craft, was involved in no less than six invasions across the Pacific. and beef that'll thrill you from head to heel. Okre, rice and tomaters too, and sassafras tea, boy what a brew! Families get together at the bean supper, here the Ludwig family. Carla standing, and Bill with the yellow hat, are members of the church. Carla was born into the church and she was in my oldest son's high school graduation class. Some out-of-town friends of many years standing come to the spring and fall bean suppers, allowing for semiannual fellowship where we catch up on one another's families. and potaters that would make a starvin' man hush. There is no count of the people who come and go over the two or three hour period, but I'm sure it is in the hundreds. There are about four rows of tables that are full, most of the time. There is no charge for the food but donations are accepted, just put your money in the big glass jar. Tonight the donations totaled $402. Added to the donations, however, must be the cost of the food which the members donate. My mother always told me, "Son, you be nice to the ladies in the kitchen". That was easy to do tonight. The lady in the yellow sweat shirt is my lovely wife, Julie, and, working with her, keeping the food flowing, was our good friend, Sally Wilson. There is a lot of work involved in such a large supper, refilling the cornbread and relish dishes on the table, cleaning up spills and returning dirty dishes to the kitchen. Life is short, eat your dessert first! I did, so did a lot of other people. I had a piece of strawberry-rhubarb pie. I thought they would never cut it. I knew it was there, I brought it. Everybody brought dessert of every kind imaginable. I also had a piece of Sally Wilson's raisin pie--haven't had that since the last bean supper. The table holds right at a hundred plates of dessert and it is replaced all night long. The last people to leave always take dessert--and beans too--home with them. Over and above that, there will be dessert abundant for Sunday School. some good mutten stew? You can, and lots of mint jelly too. Fresh hot biscuits, baked to a tee, and apple cider for you and me. Can't forget the hardest working members of the entire crew, the dish washers. Don and Beth are scrubbing up the pans now--I think that's my big pot Don's working on. Different people take turn at this job, but Don stayed with it most of the night. I used to really enjoy doing the dishes but now I use my replaced left hip as an excuse to get out of it. Whatever works, huh? 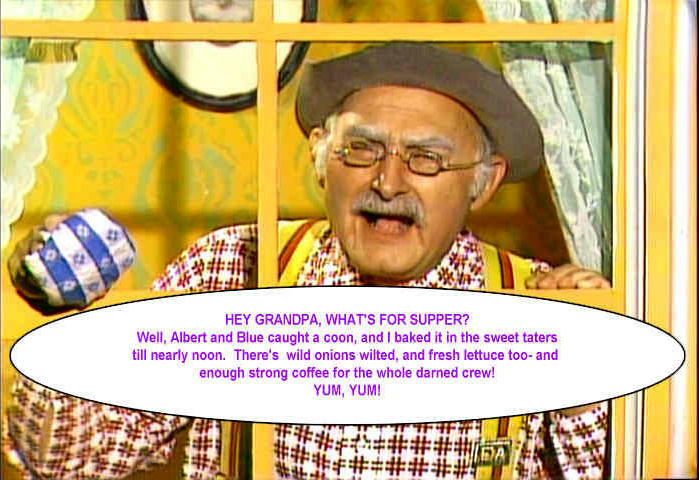 I could hear Grandpa Jones' voice as I read the quotes. He was such a character! That bean supper sounds wonderful! And I love strawberry-rhubarb pie! I'm sorry I missed out on all of that.